This standards for the coating steel galvanized for fabrication gives the requirement for coating weight, adhesion, appearance and uniformity. 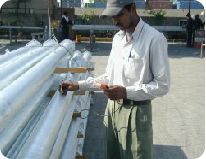 Continuous check-up is carried out to ensure the requirement of BS729 / BS EN ISO 1461:1999 and ASTM A123. If requested by our client, we weigh the article before and after dipping to find the weight per area on sample items. Sample Batching Test by thickness guage (elcometer) are carried out to check on the coating thickness. Adhesion: Knife/Hammer-test is carried to the satisfaction of the client. We are International member of the GALVANIZER'S ASSOCIATION - U.K. and the GALVANIZER'S ASSOCIATION - AUSTRALIA. Certificate to record inspection and testing for compliance with BS 729 / BS EN ISO 1461:1999- ASTM A123 is issued upon client request. Since March 1996 we have been certified by M/S ABS Quality Evaluation as an approved company in conformance with ISO 9001 : 2000 / BS EN ISO 9001 : 2000 for quality management applicable to Surface Preparation, Hot Dip Galvanizing and Painting. An effective Health, Safety & Environment system has been developed in compliance with international standards & implementation is in progress.